Hanuman, is renowned for his courage, power and faithful, selfless service. 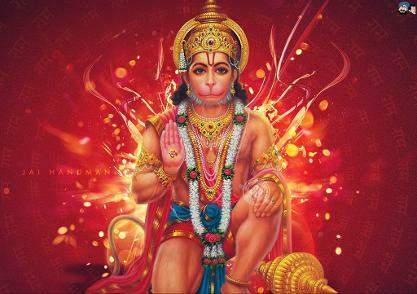 He is worshiped in the temples as Bhaktha Hanuman & Veera Hanuman. He is seen seated humbly in front of Rama vigrahmas in the Rama sannadhis. There are also separate temples for Hanuman. As Bhaktha Hanuman he is seen holding both hands together in prayer. He is seen as Veera Hanuman, holding the mace in one hand & the sanjeevi Parvatham in the other. Devotees are blessed with courage, valour, wisdom, gnanam. He is very happy when he hears the Rama namam. Hence repeating the Raama namam is the best way to get his blessings.